It was always clear that Trump has a poor understanding of how diplomacy works. In the past year, many left-leaning Americans have had the strange experience of finding themselves vigorously nodding along with a handful of right-wingers with whom they never thought they’d agree about anything. We can now add Tennessee senator Bob Corker to that list, for the same reason as the rest: He has said something obviously true but politically taboo about the incompetence of Donald Trump. In their escalating war of words on Sunday, Corker, the chair of the Senate Foreign Relations Committee, tore into Trump in a New York Times interview, accusing the president of acting “like he’s doing The Apprentice or something” and putting the country “on the path to World War III” with his reality-show mentality and Twitter antics. While President Trump’s unconventional leadership has elicited concern and rebuke from his fellow Republicans before, Corker may be the first to explicitly label his behavior a threat to national security. “I know for a fact that every single day at the White House, it’s a situation of trying to contain him,” Corker told the Times. Earlier in the day, Corker referred to the Trump White House as an “adult day care center” where “somebody obviously missed their shift” after the president hurled a string of insults at him on Twitter. 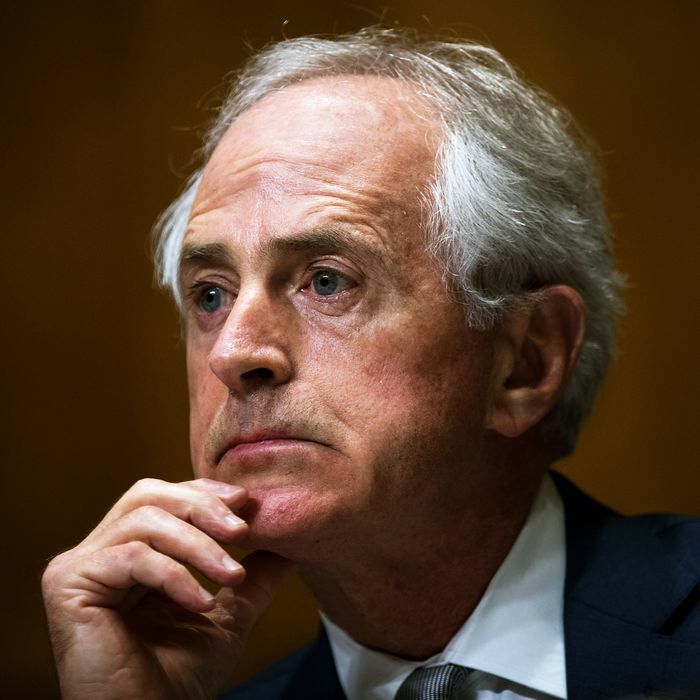 Corker had incurred Trump’s wrath by saying last week that Chief of Staff John Kelly, Defense Secretary James Mattis, and Secretary of State Rex Tillerson were helping “separate our country from chaos” by reining in their boss. “I don’t think he appreciates that when the president of the United States speaks and says the things that he does, the impact that it has around the world, especially in the region that he’s addressing,” Corker said, astutely identifying the danger inherent in a president to whom the concept of message discipline is entirely foreign. While it is entirely possible that Trump’s saber-rattling is a bluff and that he has neither intentions nor plans for a war with North Korea, the North Koreans don’t know that, and every tweeted provocation opens up the possibility of Kim Jong-un deciding that this time, the crazy old man in Washington really means it, so he’d better fire all his missiles while he still has them. Like nuclear fission itself, our most likely path to nuclear war is an unstoppable chain reaction set off by the president with the push of a button. On top of not understanding how much power his words have, Corker might have added that Trump doesn’t appreciate how little control he has over whether these tensions spiral into outright war, especially once he has set the ball of North Korean paranoia rolling. Corker’s complaint that Trump treats the Oval Office like the set of a reality-TV show is also well-taken, considering how eerily Trump’s keep-’em-guessing approach to war planning resembles a teaser for sweeps week: “Maybe it’s the calm before the storm.” What storm, Mr. President? “You’ll find out.” That’s right, folks: Tune in next week to find out if 200,000 Koreans die in a nuclear inferno. That Corker is the only Republican openly remarking on the irresponsibility of this behavior is, frankly, an indictment of the rest of the party. Those among the GOP who are surprised at Trump’s antics, by the way, would do well to remember that he repeatedly and explicitly promised to behave like this on the campaign trail last year, claiming that it was stupid to give any clear indication of what he planned to do before doing it, especially when it comes to military policy. Recall how he dodged the question of how he would fight ISIS by saying the crux of his whole plan was not to tell anyone what his plan was, or his nonsensical proposal to drive the militants out of Mosul with a surprise attack. An amateur’s understanding of strategic ambiguity and the element of surprise has always underpinned Trump’s thinking about how a smart president conducts foreign policy, and in this respect, he has acted exactly as he said he would all along. So let’s not give Trump’s Republican critics too much credit here: They had enough evidence to know exactly what kind of erratic person they were hitching their wagons to last year, and went ahead and endorsed him anyway. Perhaps Corker will think twice the next time he has the urge to help someone get elected president and then try to change everything about them afterward.